From weather to shopping, the chat bot experience is only just beginning. Get ready to make friends with chat bots on Facebook. The first few chat bots have settled into Facebook Messenger this week, but an army of the artificially intelligent helpers are on the way with a plan to change the way you get information, order food, shop and even stay entertained. Chat bots were one of the focal points of Facebook's annual F8 developer's conference this week in San Francisco. "It's this notion of conversations as a service," Patrick Moorhead, an analysts at Moor Insights & Strategy, told ABC News. "The whole element of bots are we can use them exactly like we chat today -- over SMS [text messages] or Messenger. Imagine connecting with a company where it automatically is either a real human or uses AI to know exactly what you want." Here's a look at some of the early settlers in chat bot land on Facebook. Sending a message to a bot works the same way as sending a message to a friend. 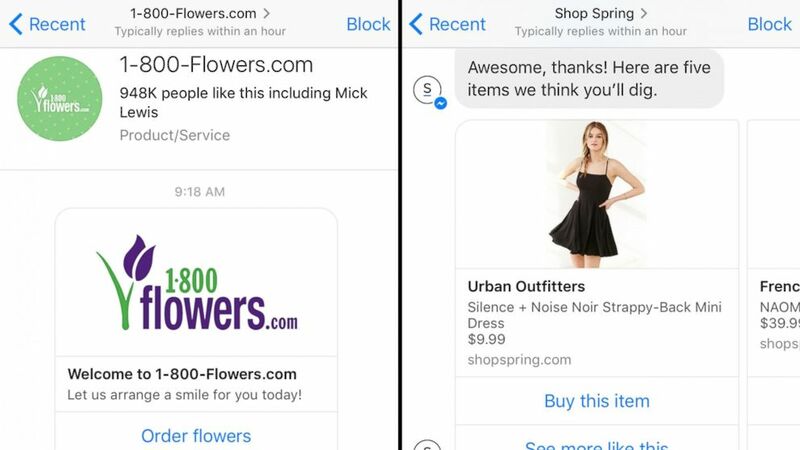 The flower company will help customers find the perfect bouquet to order through Messenger while also answering any customer support questions. (Alyssa Newcomb/ABC News) Images made from the Facebook Messenger app on April 14, 2016 show conversations with 1-800-Flowers.com and Shop Spring chat bots. Think of the Shop Spring bot as your personal shopper. After messaging Spring, it asks a few questions to help narrow down what a customer is looking for and then serves up a few options they may like with an easy link to buy the item. 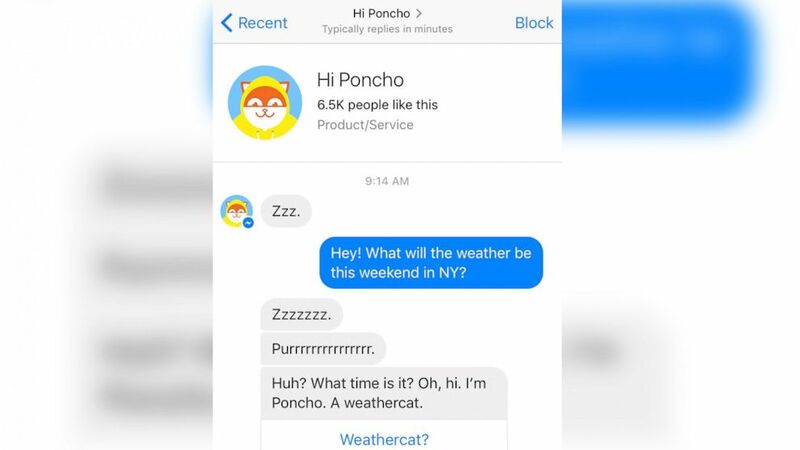 (Alyssa Newcomb/ABC News) A screen grab made from the Facebook Messenger app on April 14, 2016 shows a conversation with the "Hi Poncho" chat bot. The "friendly neighborhood weather cat" is on Messenger and can give users personalized weather reports. Poncho is even considerate enough to include pollen levels and warnings when the weather may cause a frizzy hair day, if you tell him you're interested in those alerts. 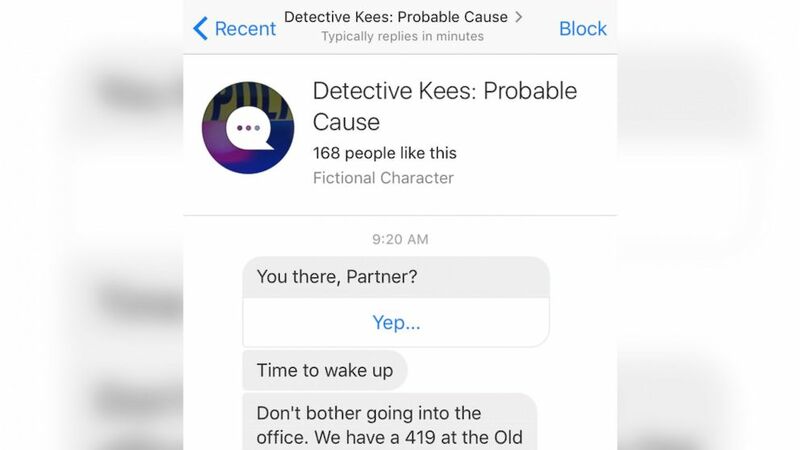 (Alyssa Newcomb/ABC News) A screen grab made from the Facebook Messenger app on April 14, 2016 shows a conversation with the "Detective Kees: Probable Cause" chat bot. The murder mystery, choose-your-own-adventure style game takes sleuths along with Detective Kees to help solve murder mysteries. Facebook CEO Mark Zuckerberg announced Messenger Platform at the start of the company's annual F8 developer's conference on Tuesday. The new service is a framework powered by artificial intelligence, allowing developers to build chat bots that can communicate one on one with users in a conversational tone. The more use, the more personalized a bot can be in serving a user. "You probably interact with dozens of businesses every day ... but I’ve never met anyone who likes calling a business and no one wants to install an app for every business or service they want to interact with," Zuckerberg said.